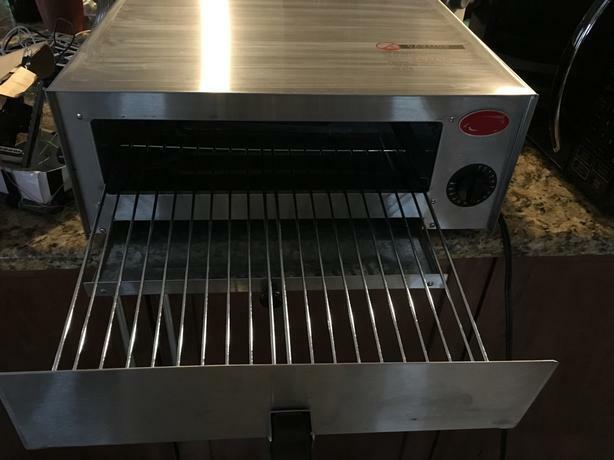 $119 · Pizza / Snack Oven (Counter Top), Less Than 6 Months Old! In perfect (like new) condition, works well and pizza crusts come out perfect. Easy to use, clean and maintain. Inside looks just like new. Would be good for a coffee shop, snack bar, café or smaller restaurant. Two heating elements deliver a total of 1450W and a cooking temperature of 450 degrees Fahrenheit, giving pizzas a crispy crust in only 15-20 minutes. 2 .5" tall opening for the wire product rack, and is wide enough to accommodate a 12" pizza.